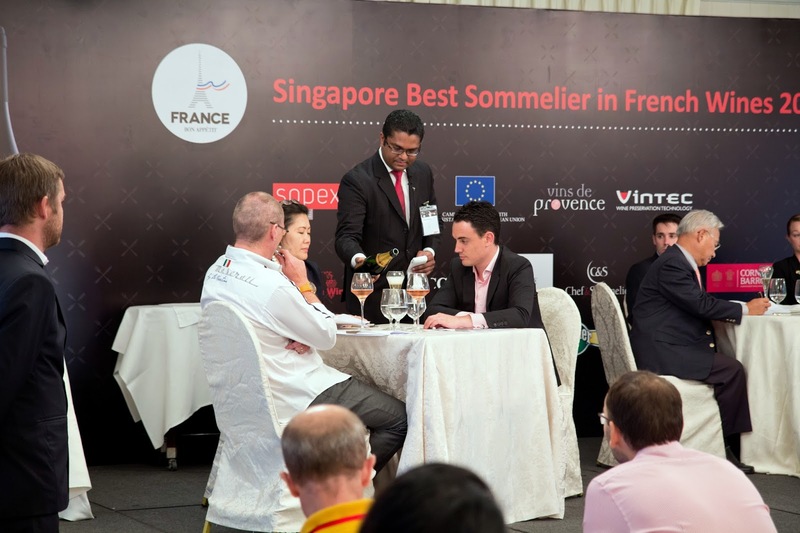 It was the Singapore Best Sommelier in French Wines 2015 competition and local sommeliers came to prove their mettle. 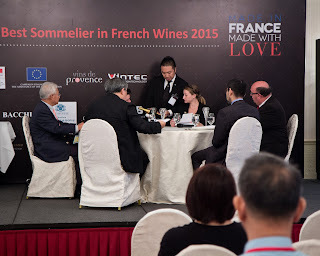 This event held on 9 Sep 2015 (at Raffles Hotel) was organized by Sopexa. 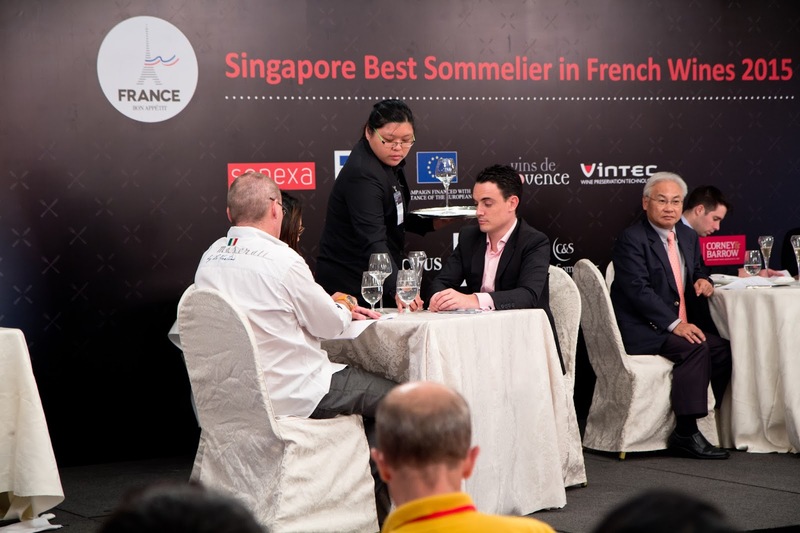 The preliminary round saw 10 contestants taking part in the trials. Four were selected to compete in the final round. 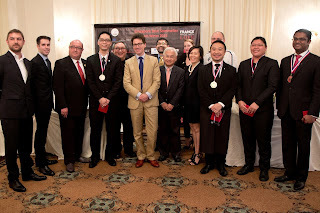 They were: Alan Kok Koong Au (from Iggys), Alvin Goh (from MBS), Inthran Ramasamy (from Mandarin Oriental) and Jacques Chua Shu Hui (from 1855 The Bottle Shop). - Opening and serving sparkling wine. - Decanting and serving red wine. 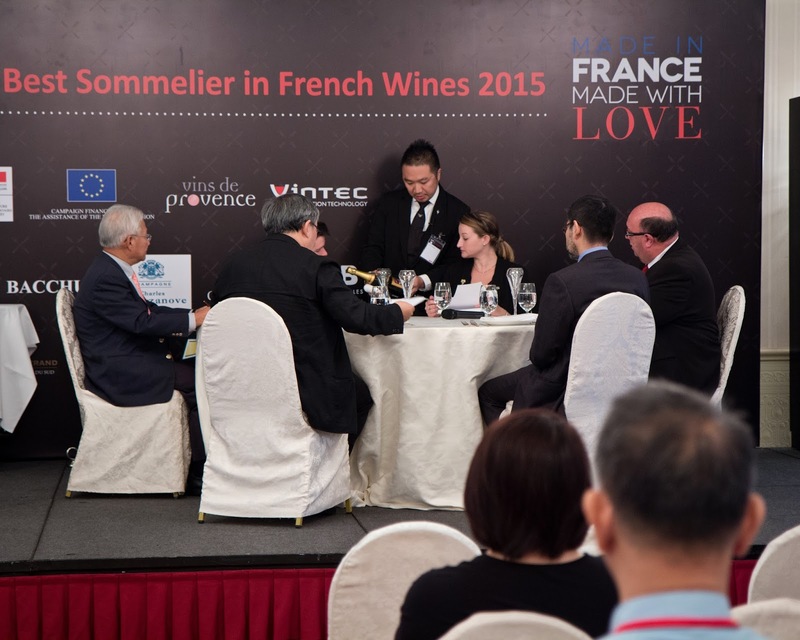 - Identifying wine in a blind tasting format. 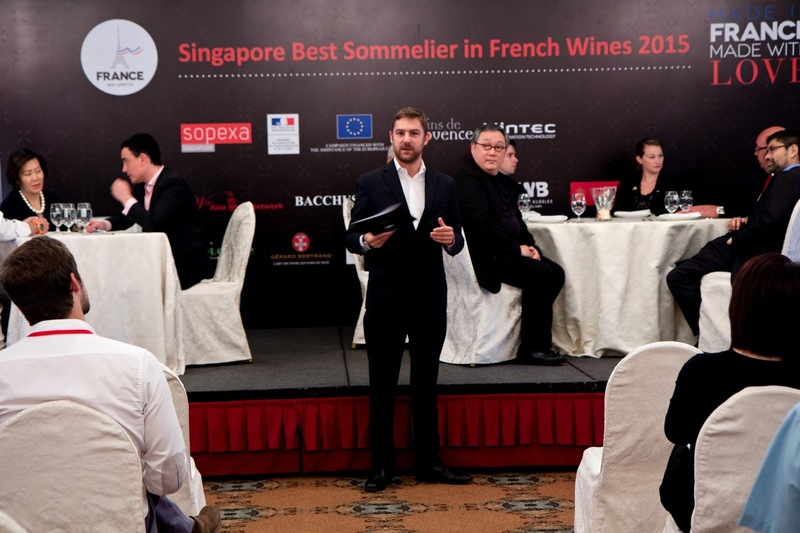 - Identifying flaws in a wine list and correcting them. Seeing these contestants compete, one has to realize that it is one thing having some wine knowledge to cope with the weekly indulgence of drinking wines with friends and discussing what the wine in the glass reveals; but it is totally a different ball game having to handle wine service while at the same time holding a conversation with wine judges and promptly answering their calculated queries. 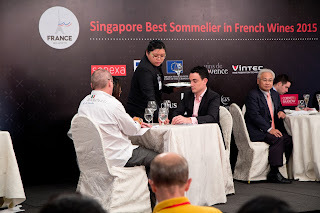 You need knowledge and skill, but more than that, a degree of confidence, flair and suave factor to do the ‘sommelier dance’ around the table of judges and impress them... not forgetting the roomful of industry folks who quietly watch your every move and listen to every word uttered. Prior to announcing the winners , the judges in their comments highlighted that the contestants showed good knowledge and enthusiasm but will have to take note on being calm (keeping their cool) and to work within the allotted time for each task. Another point which was highlighted was on the need to listen carefully to the instructions given so that contestants take note of what exactly is required of them (and not waste time on things which does not gain them points). 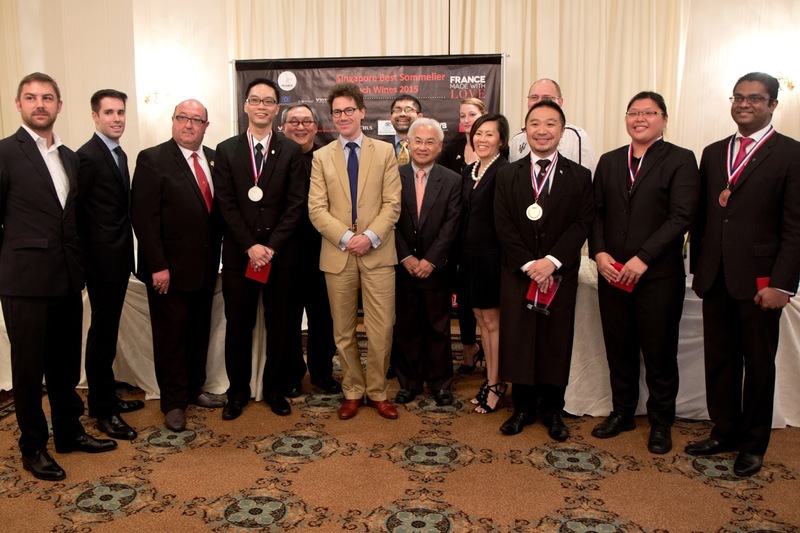 The winner Alvin Goh and runner-up Alan Au will go on to attend a similar competition on 9 Dec 2015 in Kuala Lumpur; this time held at the Asian level. Its called the Asia Best Sommelier Competition in French Wines 2015. Other countries participating in this competition will be Singapore, Malaysia, Vietnam, Thailand, Indonesia, Taiwan, Korea (and Macao to be confirmed). Needless to say, they have the wishes of the local wine industry folks for the upcoming competition! The Formula One race was held in Singapore recently on 20 Sept and that brought Jose Moro of Bodegas Emilio Moro and his brand Ambassador Ms Marta Valdespino to Singapore for a visit. Over dinner, they took the opportunity to introduce some of their wines. Bodegas Emilio Moro is located in the province of Valladolid, within the wine region of Ribera del Duero, northern Spain. Since 1982 when Ribera del Duero gained the Denominación de Origen (D.O.) status, the wine scene in this region has notably increased. Where once existed a handful of wineries; the number has grown to at least 250 now. The Emilio Moro estate (located in the village of Pesquera de Duero) first commercially launched wines under its estate label in 1989; however, this family has been involved in winemaking for 3 generations over a span of more than a hundred years. Ms Marta explained that the first 2 wines come from its winery located on the northern bank of the Duero river. Here Tinto Fino vines grow under a continental climate condition. Low precipitations with spring rains, dry summers, long and harsh winters and a sharp fluctuation between day/night temperature contribute to the slow maturation of grapes giving grapes an opportunity to attain physiological ripeness. The soil composition in this area is by and large made up of chalk, clay and gravels. Vines grown in various sub-plots (of differing soil composition) contribute their own personality to the end wine in the bottle. The Emilio Moro 2013 is produced from vines which are between 15 and 25 years old. The crushed grapes go through 12 days of maceration on skin. The resulting wine is aged for 12 months in French and American oak barrels. The Emilio Moro Malleolus 2011 comes from vines which are between 25 and seventy-five years old. It goes through 18 days of maceration on skin and is aged for 18 months in Allier French oak barrels. (The Malleolus was first launched in 1998). The Cepa 21 wines come from a new project by the Emilio Moro family. Inaugurated in 2007, this winery is located on the southern bank of the Duero River on a 50h land. The location offers one of the coldest terrior in Ribera del Douro. It holds a northern orientation with soil types ranging from loam, chalky, clay and stony. Cepa 21 2009 comes from grapes grown at an altitude between 850m and 900m. Grapes go through 18 days maceration on skin; and resulting wine is aged 12 months in French and American oak barrels. Cepa 21 Malabrigo 2010 contains grapes which come from a single estate vineyard. Grapes go through 26 days of maceration and resulting wine spends 18 months in French oak barrels. (The 2010 vintage is its first release). I tasted these wines in both Bordeaux and Burgundy glasses; and at least for my palate, I preferred the showing in the burgundy glass. 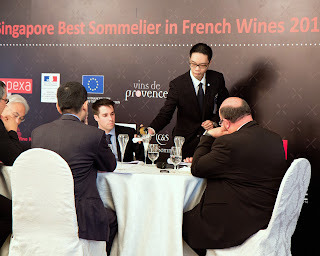 It revealed better the aromatics and displayed a smooth, supple mouthfeel when tasted in the latter glass. A little aeration certainly helps to reveal the flavour profile and nuances within these wines as well; a little patience definitely helps with these wines. Bodegas Emilio Moro 2013 is a clean, fresh sip with black cherry and spice notes showing upfront. In a burgundy glass, it shows itself as a smooth, soft and elegant wine with good acidity balancing the fruit. A youthful sip to be enjoyed for the fruit presence and freshness at this moment. Bodegas Emilio Moro Malleolus 2011 displayed more in terms of aromatics (berries, balsamic, spice, hint of tobacco). Certainly holds a rich mouthfeel and an opulent body with ripe fruit presence. Tannins are noticeable in the fringes but not harsh. Bodegas Cepa 21 2009. Another wine with a good showing of aromatics (can just relax and enjoy the nose). It’s backed by a palate revealing an elegant, supple mouthfeel with a good balance of black fruits, spice, acidity providing liveliness and a noticeable tannin presence giving structure to the body. Good aftertaste. Something to sip and savour. Bodegas Cepa 21 Malabrigo 2010. An age worthy sip. It holds a good concentration of fruits, minerality, acidity and fine tannins. It will be interesting to revisit this sip 8-10 years down the line as it shows a potential to gain complexity. The Emilio Moro wines have a good following in Spain itself where 70% of annual production is consumed. Three big export markets are the Americas and Europe. Presently these wines are exported to more than 50 countries. In Asia, they can be found in countries like Japan, Korea, China, Hong Kong, Taiwan Thailand, Philippines, Malaysia and Singapore. They have been in Singapore for around 4 years now. 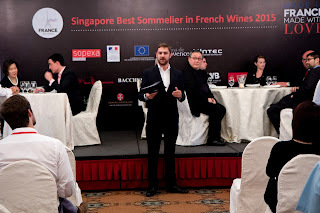 Alfa International Pte Ltd is currently the local distributor and you can find these wines at ewineasia.com. More more pictures of this dinner, you can check the following link: An Emilio Moro tasting and dinner.